The Local Roads Advisory Committee is a Committee of the Minister for Transport and is charged with the responsibility of making recommendations to the Minister on matters relating to the classification of roads in South Australia. The Committee currently comprises of Mr Michael (Bim) Lange Chairperson, Mr Don Hogben, General Manager, Intergovernmental Relations of the Department of Planning, Transport and Infrastructure (DPTI) and Mr Peter Ilee, Executive Officer, SA Local Government Grants Commission, DPTI. The Executive Officer of the Committee is Mr Grant Sellek, Principal Advisor Policy, Transport Assessment and Policy Reform DPTI. 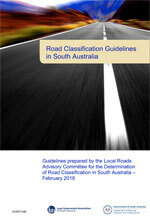 The Committee has developed a revised set of Guidelines for use in determining the classification of roads in South Australia. These Guidelines were approved by the Minister for Transport in March 2008 and were updated in February 2018. If you require further information on the work of the Local Roads Advisory Committee, please contact Mr Grant Sellek on telephone number (08) 7109 7079.